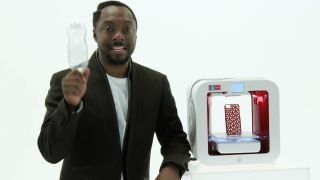 Ah, Will.i.am - rapper, producer, tech entrepreneur, and now clairvoyant. Always up for speaking his mind, Mr i.am recently splurged his thoughts on the future of 3D printing. "Eventually 3D printing will print people," he told Deezen. "I'm not saying I agree with it, I'm just saying what's fact based on plausible growth in technology." Uhuh. Well don't worry about getting caught up in any moral quandaries there Will, because quite frankly you're jumping the gun a bit. Even if 3D printers can successfully churn out an organ or two, printing a fully functioning humanoid is an entirely different matter - probably not something that any of us will see in our lifetimes. "If you can print a liver or a kidney, God dang it, you're going to be able to print a whole freaking person," he went on. "Now we're getting into a whole new territory. Moses comes down with the 10 commandments and says 'Thou shalt not...'. He didn't say sh*t about 3D printing." Unconvinced, we turned to our trusty Bible to corroborate Will's claim - it checks out. What's more perplexing, though, is the next part. "You're starting with beef, and leathers, and body parts, eventually it will get more complex," said Will. "It's basically 'Beam me up, Scotty', a 3D printer that disintegrates the source." Boom boom pow, them blips jackin' my style.